Please join us at Counterpath (7935 East 14th Ave. in Denver) on Saturday, November 24th at 7pm for an evening of readings by Kim Adrian, Sarah Boyer, and Phil Cordelli. Free and open to the public. 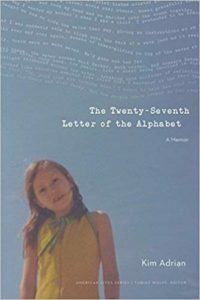 Kim Adrian is the author of The Twenty-Seventh Letter of the Alphabet (University of Nebraska Press) and Sock (Bloomsbury). She is the editor of The Shell Game: Writers Play with Borrowed Forms, an anthology of lyric essays. Her work has received several awards and recognitions, including a scholarship to the Breadloaf Writers Conference and one to the Key West Literary Seminars, a Massachusetts Cultural Council Artist’s Grant, fellowships at the Edward Albee Barn, the Ragdale Foundation, and the Virginia Center for the Creative Arts, and a PEN New England Discovery Award. She has taught at Brown and Boston Universities, and is currently at work on a novel based on the life and writings of E.T.A. Hoffmann. Sarah Boyer is the author of Howard (Sunny Outside) as well as numerous unpublished works of international import. Phil Cordelli is the author of Manual of Woody Plants (Ugly Duckling Presse) as well as numerous unpublished works of local interest. Together they reside in Denver along with Leveret and Oyster, small human and medium-sized dog, respectively.